"I never lived through the '60s, but when I think of a love-in, I think it must be like this for an author." 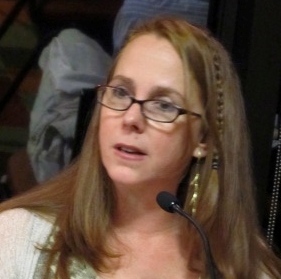 --Hillary Jordan, author of When She Woke and Mudbound, speaking at the Author Banquet for Literacy during last weekend's Mountains and Plains Independent Booksellers Association trade show in Denver. 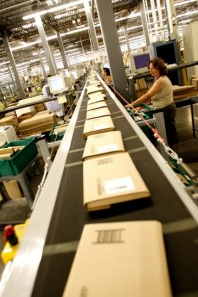 Amazon will have to collect sales taxes in Tennessee if the company has warehouses there, according to an opinion released Tuesday by Attorney General Robert Cooper. Although he didn't mention Amazon, Cooper ruled "current state law already requires retailers that open distribution facilities or warehouses in Tennessee to collect sales taxes on their customers," the Tennessean reported, adding that the opinion may give state lawmakers more power. "That makes it a little more difficult, if they (lawmakers) have to green light everything," said Governor Bill Haslam, who is trying to resolve the controversy sparked by his predecessor, Phil Bredesen, whose administration assured Amazon that opening three distribution centers in the state would not trigger laws requiring the company to collect sales taxes. While Haslam has agreed to uphold the promise, he has also pressured Amazon to come up with a compromise solution along the lines of those negotiated in California and South Carolina. "We continue to have discussions with Amazon," Haslam said. "Hopefully, we can come up with something that works for everybody sooner rather than later." Cooper's opinion "also says state revenue officials have the right to interpret tax laws as they see fit when the situation is not clear-cut. That would appear to give the Haslam administration some room to leave Amazon's tax status unchanged until he reaches a compromise with the company, but he said it also might force him to take a deal to the legislature for approval once reached," the Tennessean wrote. 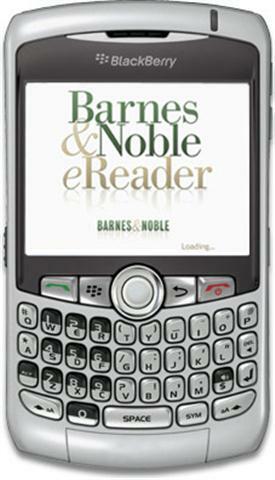 Barnes & Noble has "quietly put the hammer to the BlackBerry" by dropping its e-reader app. 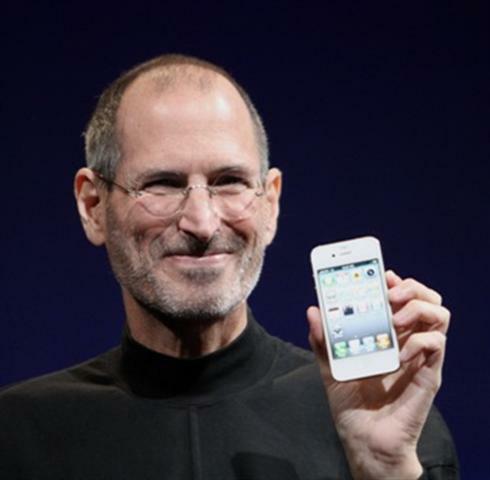 ZDNet reported that now "new purchases cannot be directly pushed onto phones, with support totally ending this year." B&N offered no reason for the change, but ZDNet suggested "it is telling that even though it already has the app on the BlackBerry, and it allows purchasing content from B&N, it is no longer going to let that happen. Perhaps the company finds it too expensive to maintain and support the BlackBerry. It is a drastic measure to kill a platform that can currently purchase content." 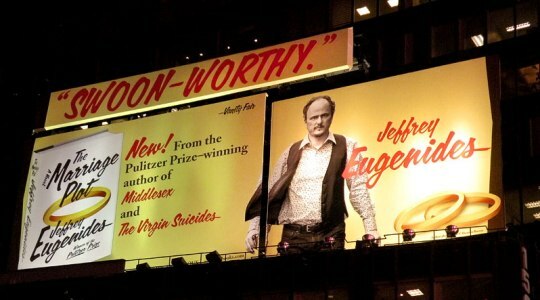 An impressive and dramatic Times Square billboard promoting Jeffrey Eugenides's soon-to-be released novel is garnering attention in the streets as well as the media. Verso Advertising was "thrilled when Farrar, Straus and Giroux gave us the go-ahead for a Times Square billboard for his amazing new novel, The Marriage Plot. OK, maybe a little surprised, but FSG has always been good at keeping us on our toes. Our design and production team had a blast working on the creative." "It was kind of serendipity meets opportunism," Jeff Seroy, FSG's senior v-p of marketing and publicity, told the Wall Street Journal. "We have that great photo of Jeff, which looks like the Marlboro Man, a classic billboard image." Eugenides observed: "I go back to the flinty Roger Straus days, when FSG wouldn't run so much as an ad in the [New York Times] Book Review. So when they said they were putting up a billboard in Times Square, I figured I should keep my mouth shut." The Atlantic: "All we can say is, The Marriage Plot looks like the best summer movie since Indiana Jones and the Last Crusade." Village Voice: "It's rare that literary stars get treated like Hollywood stars, and it's kind of cool. Look at the dude. Vest blowing in the wind, intense frown.... he recalls Indiana Jones but nerdier." Last weekend Farcountry Press, Helena, Mont., joined the celebration of the 100th anniversary of teenage aviation pioneer Cromwell Dixon's flight over the Continental Divide. At the event, author Martin J. Kidston signed copies of his Dixon biography, Cromwell Dixon: A Boy and His Plane, and musicians played songs of the early 20th century while visitors tried flight simulators and viewed antique planes and experimental aircraft. Pilots with the Experimental Aircraft Association #344 flew kids, community members, Dixon's grand nephew and Farcountry Press staff over the Divide to view the mountain site where Dixon landed in 1911. 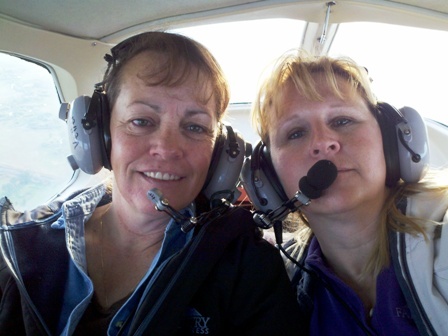 Here, aloft, are Farcountry's Sue Johnson, sales, and Linda Netschert, owner and publisher. Noting that "indie booksellers also hold up half the sky," science fiction and fantasy publisher Tor will feature monthly picks by indies on its blog, asking booksellers "from somewhere in the universe what they think we should be reading. At the same time you'll get a little bit of information about the booksellers themselves. We'll not only be showcasing great reading lists but also putting a spotlight on the many wonderful independent homes for SF&F books around the world." 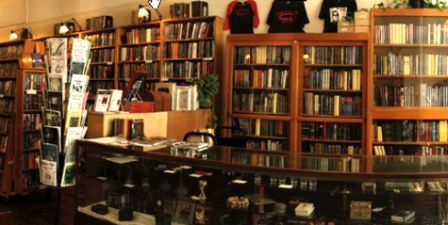 Kicking things off this month is Borderlands Books, San Francisco, Calif.
A makeshift tent bookshop has opened in the Japanese town of Kesennuma, which was devastated by an earthquake and tsunami last spring. The Mainichi Daily News reported that a franchise of the nationwide bookstore chain Miyawaki Shoten was destroyed and lost "230,000 books from inside the store, leaving only its steel beams behind. Debris surrounded the site, while the ground sank by 70 centimeters, allowing seawater to submerge the remaining structure." 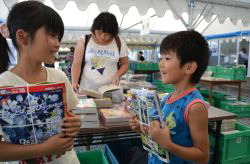 In May, owners Mitsuho Chida and his wife, Koko, opened a temporary bookstore using a two-ton truck in the parking lot of an auto dealership and launched their tented bookstore in July. Now that autumn is approaching, they "continue to operate the open-air bookstore, which is covered with plastic wind sheets, until they open a new prefabricated outlet at the end of this year," the Daily News wrote. The Chidas are "hoping to be of help with the recovery of this city, if only a little." The penguin did it. As part of its launch campaign for Andrey Kurkov's Russian crime fiction series, Melville House has invited bricks-and-mortar bookstores to participate in its Adopt-a-Penguin program. The publisher will adopt a penguin in the name of any bookstore that sells 25 copies of Death and the Penguin and/or Penguin Lost. The contest will run until December 31. Printable shelf-talkers and posters are available on the Penguin Lost website. 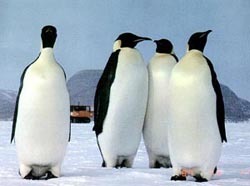 "I love competition and I love penguins," said WORD Brooklyn owner Christine Onorati, who is participating. When you first read Nick Hornby's novel High Fidelity, you knew immediately what the narrator was talking about when he said, "I spent hours putting that cassette together.... A good compilation tape, like breaking up, is hard to do." 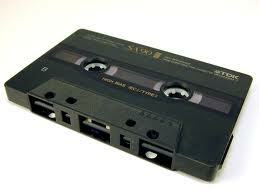 But now that the editors of the Concise Oxford English Dictionary have decided to remove the term "cassette tape" from its pages, a certain amount of literary confusion may be inevitable in the future. On his Facebook page, Hornby wrote: "So let me get this straight: in ten years' time, someone will be reading a book--High Fidelity, say--and comes across a term that he or she doesn't understand, and goes to a dictionary, and it's not there? Thanks, OED." On NPR's Science Friday: Brian Clegg, author of Inflight Science: A Guide to the World From Your Airplane Window (Totem Books/Consortium, $16.95, 9781848312418). Tomorrow on Ellen: Taye Diggs, author of Chocolate Me! (Feiwel & Friends, $16.99, 9780312603267). Tomorrow on CBS's the Talk: Florence Henderson, author of Life Is Not a Stage: From Broadway Baby to a Lovely Lady and Beyond (Center Street, $25.99, 9781599953885). Tomorrow on HBO's Real Time with Bill Maher: Nicolle Wallace, author of It's Classified (Atria, $25, 9781451610963). DreamWorks and Disney have moved Steven Spielberg's War Horse from its December 28 release date to Christmas Day. Deadline.com featured the latest trailer for the film adaptation of Michael Morpurgo's book. Legendary director Werner Herzog (Grizzly Man, Encounters at the End of the World, Cave of Forgotten Dreams) "will step from behind the camera to play the villain" in One Shot, adapted from the Jack Reacher novel by Lee Child, the Hollywood Reporter wrote. Herzog joins a cast that includes Tom Cruise, Rosamund Pike, David Oyelowo and Richard Jenkins. Christopher McQuarrie is directing the script he wrote. Filming is set to begin in Pittsburgh this month. Moneyball, the hit film adaptation of Michael Lewis's bestselling book, has now inspired a hilarious fake movie trailer, Too Much Moneyball, which imagines what might happen if the subject of all this attention had been the big-spending New York Yankees instead of the thrifty Oakland A's. 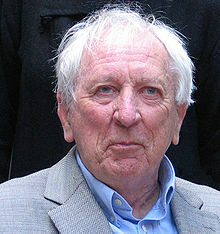 The 2011 Nobel Prize in literature has been awarded to Swedish poet Tomas Tranströmer. The citation from the committee said that "through his condensed translucent images he gives us fresh access to reality." The Guardian noted that Peter Englund, the permanent secretary of the academy, said Tranströmer's production has been "sparse... you could fit it into a not too large pocket book, all of it," but praised his "exquisite" language. "He is writing about the big questions--about death, history, memory, nature. Human beings are sort of the prism where all these great entities meet and it makes us important. You can never feel small after reading the poetry of Tomas Tranströmer." The Washington Post reported that the 80-year-old Tranströmer "has been a perennial favorite for the 10 million kronor ($1.5 million) award, and in recent years Swedish journalists have waited outside his apartment in Stockholm on the day the literature prize was announced." Tranströmer’s works have been translated into more than 50 languages and influenced poets around the globe, particularly in North America, the Post wrote, adding that his "most famous works include the 1966 Windows and Stones, in which he depicts themes from his many travels and Baltics from 1974." "Much of his work has been translated into English by the American poet Robert Bly, a personal friend," BBC News noted. Tranströmer had been among the favorites to win this year's prize, but the odds at British handicapper Ladbrokes changed dramatically overnight as late money made him the prohibitive favorite at 4-6, followed by Bob Dylan, Haruki Murakami, Adonis and Assia Djebar. John Burnside, who had made the shortlist three times previously, finally broke through to win the £10,000 (US$15,467) Forward Poetry Prize for his collection Black Cat Bone. The Guardian reported that Rachael Boast's Sidereal took the £5,000 award for best first collection and the late R.F. Langley won for best single poem. Walter Wick, author and photographer, takes us inside his studio for a look at his new book of eye candy, Can You See What I See: Toyland Express (Scholastic/Cartwheel, $13.99, 9780545244831). When Sarah Murray's father died, he left behind a file whimsically entitled "How to End It!" containing instructions for what Murray and her family were to do with his remains. A lifelong atheist, he believed that after death, the body was merely "organic matter" to be disposed of, and he insisted that his family should not hold a memorial or gathering after his passing. It came as no small surprise to Murray, then, when her father's instructions turned out to be remarkably detailed. "Atheism," she remarks, "provides little guidance on how to deal with the end of life," so where, she wondered, did her father's interest in what was done with his remains come from? Her father's death--and his unexpectedly specific directives--prompted Murray to undertake a series of globetrotting adventures as she inquired into what our approaches to death--that most final of adventures--reveal about our "most deeply held philosophies, superstitions, hopes, and fears." In other words, what does how we die say about how we live? In a weeping ceremony in Iran, Murray sees the power of public displays of emotion--particularly in contrast to the "stiff upper lip" philosophy of her native Britain--and the utility of ritualized mourning to give expression to the inexpressible and provide a framework for coping with the difficulty of loss. The party atmosphere at a Balinese cremation rite leads to a discussion of cremation practices around the world; research into ancient embalming techniques brings about an exploration of contemporary open-casket funerals. From the Ingresso Catacombs in Palermo to a cemetery outside Hong Kong to a coffin maker's shop in Ghana (she orders a personalized coffin in the shape of the Empire State Building), Murray contemplates our connection to the bodies of the dead and our need to make arrangements for what will happen when we die. "No longer convinced of spiritual eternity," she posits, "it seems we're starting to look for it on earth." Shelf Talker: In a combination of memoir and journalism, Sarah Murray presents a fascinating inquiry into what our approaches to death and burial reveal about the way we live.